Marie was born in Holland on September 23, 1933. She grew up on the same dike as Andreas. They lived about one mile apart from each other. Marie was the youngest of 12 children – eight girls and four boys. Her father was a vegetable farmer and her mother passed away when Marie was only nine. One thing that she vividly remembers from her childhood in Holland during World War II. She remembers being very frightened, especially at night when air raids flew overhead and they had to turn out all the lights and hide in the basement. The sound of the bombs exploding nearby is something she will never forget. Marie attended the same school as Andreas. Even at a young age, they were attracted to each other, but they kept it a secret. 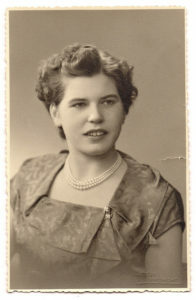 She was 15 in 1948 when Andreas and his family left for the United States. She sadly thought that she would never see him again. She finished school and took some English lessons. She dated a few boys but she could not forget about Andreas. In 1951 she was happy to receive a Christmas card from him and they began writing letters. In 1953 Andreas came back to Holland to visit for 6 weeks, and while he was there, on her 20th birthday, he asked Marie to marry him. She started getting her papers in order, and in February of 1955, she set sail for the United States, leaving all of her friends and family behind. It was hard to say goodbye to everybody because she didn’t think she would ever see them again. Many tears were shed that day, but Marie was excited about her future and has never regretted her decision to go, not even for one day. Andreas was there waiting for her when she got off the boat, but her trip was not over. From New Jersey, they drove all the way across the country to Washington State in the middle of the winter in a 1949 Ford Coupe. There were no freeways or studded snow tires. It was a long hard trip but they made it in less than a week. Marie found a job as a live-in nanny for a school superintendent. She learned the language fast out of necessity. 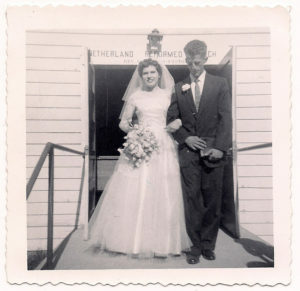 Every weekend Andreas came to pick her up, and on July 18, 1956, they were married. Andreas and Marie had 6 children – 3 boys and 3 girls. Their lives consisted of a lot of hard work and a lot of laughter. Marie ran a tight ship in the home while Andreas was working hard in the fields. Throughout the years, Marie made sure that the two most important things were completely taken care of – her home and her family. She worked from dawn until dark, and no matter what time the boys came in for dinner there was always a hot meal and a caring woman waiting for them. She did all of this with a smile on her face and love in her heart.